A man from Kenya emerged victorious in one of the more unique attractions at the celebration of Scottish produce. The north-east has hosted a variety of food competitions in recent years, with cooks entering contests dedicated to Cullen Skink, tattie scones and even butteries. 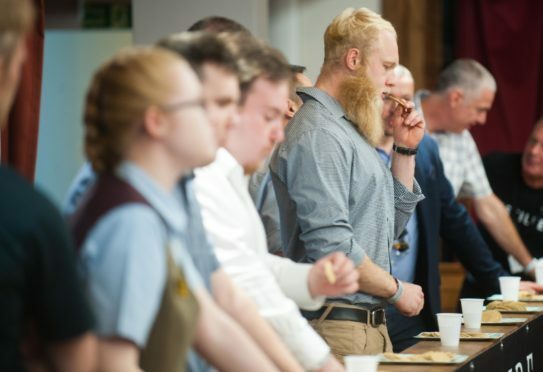 The organisers of Spirit of Speyside: Distilled decided to shine a spotlight on the humble oatcake at the weekend, with fans of the traditional snack battling to scoff as many as possible within two minutes. To make it more of a challenge, entrants were not allowed to drink any water to help wash the biscuits down and one man was disqualified for trying it. Following that spot of drama, Chivas Brothers employee Jasper Epsom rose above the rest and was crowned “world oatcake eating champion”. The brand ambassador, who works in Aberlour and is originally from Nairobi in Kenya, only decided to enter the contest on the day. He said: “I feel pretty good about being the oatcake world champion, this is not how I expected my day to turn out but I’ll take it. “I entered it because I thought it would be a laugh and something different. “I haven’t done a competition like this before so gave it a whirl. The competition was introduced by Glen Moray distillery manager Graham Coull, who did his best Rocky impression by running about the hall to the sound of Eye of the Tiger. A total of 13 volunteers undertook the challenge, but four entrants tied after eating eight oatcakes apiece. They progressed to an intense five-oatcake munch-off, with Mr Epsom polishing off all five in the quickest time to take home the crown.